Winner of Best Group in both the Live Ireland awards and the TIR awards, and a finalist for best album in the 2016 Indie Acoustic Project Awards, The Outside Track are one of the top Celtic acts in the world. A stunning synthesis of virtuosity and energy, their marriage of Celtic music, song, dance has been rapturously received around the world. 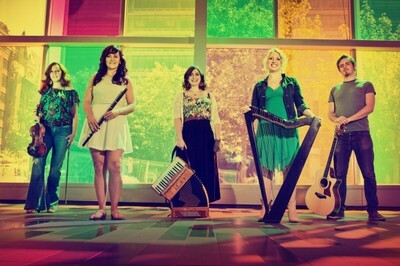 Hailing from Scotland, Ireland, and the USA, its five members are united by a love of traditional music and a commitment to creating new music on this as a foundation. They effortlessly fuse traditional and contemporary with winning joie de vivre, blending fiddle, accordion, harp, guitar, whistle, step-dance and vocals with breathtaking vitality. ‘Among the top groups in the world. Traditional, creative, and brilliant’ (LiveIreland.com).